Large Volume Injection (LVI) is a prerequisite of modern gas chromatographic (GC) analysis, especially when trace sample components have to be determined at very low concentration levels. Injection of larger than 1µl increases sensitivity and/or reduces (or even eliminates) the need for extract concentration steps. Also, an Large Volume Injection technique can serve as an interface for on-line connection of GC with a sample preparation step or with liquid chromatography. Large Volume Injection can give a big reduction in sample preparation and sample handling. The table below shows that with LVI less sample has to be collected and this results in big cost savings. With the OPTIC solvent elimination technique (large volumne injection) the liquid sample is injected into the "cold” liner of the injector. The word cold here means that the temperature of the injector should be below the boiling point of the solvent (e.g. at least some 10 to 30°C). At the moment of injection the split exit is open. After the injection the sample is present as a thin, small liquid film on the wall or packing of the injector depending on the liner used. Because the split line is open, a high flow of gas is flowing across the liquid film that now will be evaporated by the carrier gas. First the solvent will evaporate, as this has the lowest boiling point. 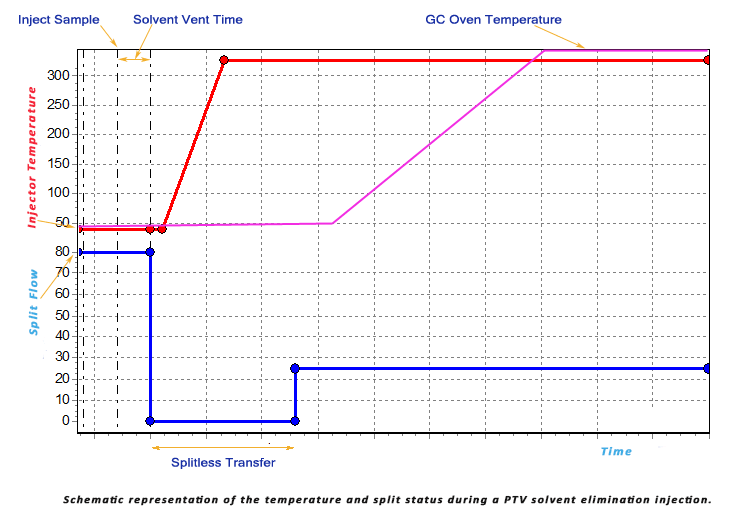 The mixture of carrier gas and solvent vapour now passes along the GC column inlet. A small fraction will enter the GC column whereas the bulk of gas will be discharged via the split exit. It is only after all of the solvent has evaporated that the other components also start to evaporate. Just before this starts to occur the split exit should be closed. If the injector is heated at this time, all of the solutes will be rapidly transported to the column. 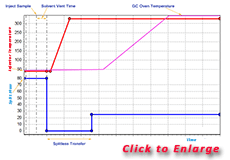 With the OPTIC inlet for gas chromatography you will have the best inlet system for your samples. The low thermal mass and the relatively big liner volume are perfect for LVI sample introduction. The inlet body has the best available temperature profile, resulting in very good transfer of the injected compounds from inlet to the analytical column. Like to read more about Large Volume Injections, read our large volume injection training guide.